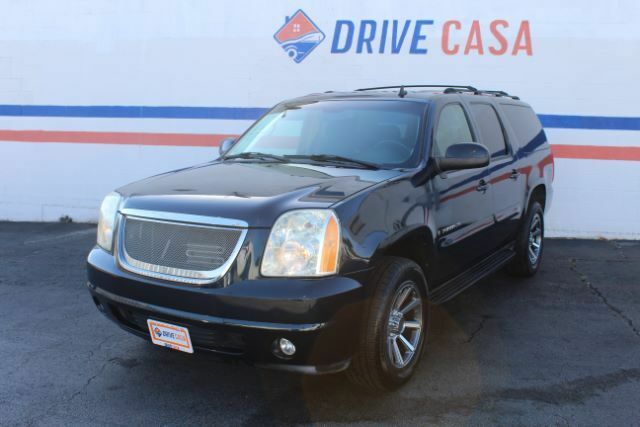 Our 2007 GMC Yukon XL SLT 1500 in Deep Blue Metallic is a maximum-size SUV for maximum-size projects. Powered by a 5.3 Liter V8 that generates 310hp mated with a 4 Speed Automatic transmission, this Rear Wheel Drive is sure to impress your friends while earning respectable gas mileage. Our Yukon XL is loaded to the gills and waiting to treat you right! Slide into the plush cloth seats, enjoy the wood grain accents throughout, adjust the tri-zone climate controls, and listen to your favorite songs on the AM/FM/CD player with AUX input. You''re going to love the comfortable seating for 8 in the full bench second and third rows, while still leaving room for extras to be stored. Plus, with GMC''s safety equipment on board, you''ll have peace of mind behind the wheel. This GMC is one amazing SUV! You''ll love its strong engine, smooth ride, and massive cabin; not to mention all of the extras this one has on board! Print this page and call us Now... We Know You Will Enjoy Your Test Drive Towards Ownership! Here at Drive Casa we pride ourselves on customer service and quality vehicles. As one of the premier Buy Here Pay Here dealers in Texas, we are passionate about helping people with poor credit or no credit at all get financed through our in-house program. Every vehicle comes with a 12 month/12,000 mile limited warranty. To top that, oil changes are on us for the first year of ownership! Stop by or call us today! We are here for you! Aqui en Drive Casa nos enorgullecemos de servicio al cliente y vehiculos de calidad. Como uno de los distribuidores principals de Buy Here Pay Here en Texas, nos apasiona ayudar a las personas con mal credito en lo absoluto o ser financiados a traves de nuestro programa interno. Cada vehiculo viene con una grantia limitada de 12 meses / 12,000 millas. Por encima de eso, los cambios de aceite estan a nuestro costo el primer ano de propiedad! Venga o llamenos hoy mismo! Estamos aqui para ti!